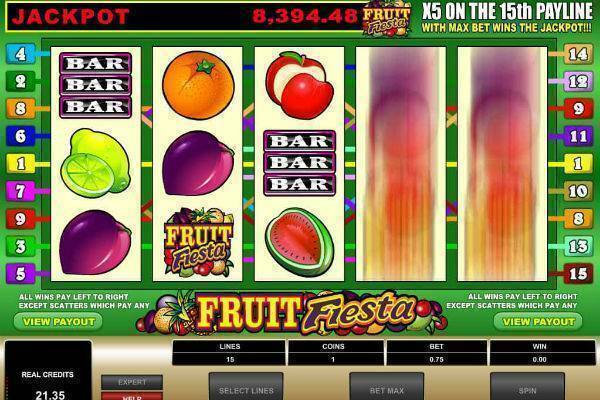 Fruit Fiesta is a 5-reel, 15-payline, low-variance slot from Microgaming. It’s an upgrade from the classic 3-reel fruit machine from back in 2009 to something more modern and throws a decent jackpot into the mix. The big draw here is the chance of hitting 5 wilds on the 15th payline, catapulting you into a bonus round and giving you a fighting chance to snag the progressively growing prize. While jackpots are attractive, the Return to Player is not, down around 90%. So our advice, if your bankroll allows, is to play at Max Bet, enjoy the game for its vintage look and feel, and hope that Lady Luck is feeling fruitful and in the mood to grant you a big win. You can play Fruit Fiesta from a mere 5p to £75 per line, with 1 to 3 coins, so this is a game that will attract newbies and high rollers alike. Choose the number of paylines and your wager amount by clicking the buttons at the bottom right. Or click Max Bet, essential for a chance at the jackpot. 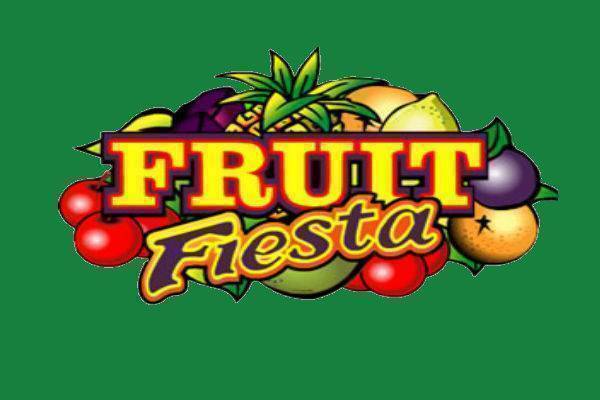 The wild symbol is the Fruit Fiesta logo, displaying the various species of fruit on offer. It replaces all other symbols except the scatter. The scatter symbol is a fruit salad. More about this in the Special Features section. According to online tracking sites, Fruit Fiesta’s jackpot prize seeds at under £1000. To have the best chance at a big win, you will want to wait till the pot reaches £10,000. Over time the jackpot has been won every 2 or 3 weeks, and the average win is in low-to-mid 5-figures, although the payout has approached 6-figures on a few occasions. To have a shot at the big money, you must go for max bet. To win the windfall prize, you need to land 5 wilds on the 15th payline. No mean feat. This slot is about as basic as a 5-reel gets. There are no spins, no stacked wilds, or other bonus features. However, 3 or more of the Scatter symbol will start to seriously increase your stake. Land 5 and you can increase your payline win by an impressive 400x credits staked. The scatter won’t jump you into a bonus game or free spins like other more modern slots, but five on a winning line will give a very healthy bump to your bankroll! The interface is pleasant and colourful: a verdant green background, filled with tangy pineapples, succulent watermelons, juicy oranges, luscious limes, crisp apples and plump plums, along with classic symbols like bars, bells and last but least, lucky sevens. The sound effects? There is a nice retro ka-ching sound for wins, but there’s nothing on the audio front to write home about. Totally retro but Fruit Fiesta somehow keeps a loyal following of fruity fans. Fruit Fiesta will not wow you, but it’s a solid classic slot and is entertaining enough. And who knows? This 5-reel, 15-payline slot from Microgaming may even make you sticky rich. Although its RTP hovers around a mere 90%, on any given spin it could change your life for the better with more than a few grand. Our advice is to wait for a mid-five-figure jackpot at stake, choose max bet, then keep your fingers crossed. Check out Fruit Fiesta’s current jackpot prize at one of our recommended casinos, and then if it feels ripe, then give it a spin!